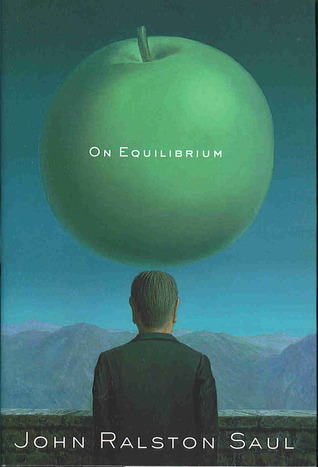 I first read On Equilibrium in my early twenties and I remember it making quite an impression on me. Now in my mid-thirties I've decided to re-read it to see if I feel the same way about it. John Ralston Saul's earlier books argue that Reason and Rationality hold too much influence over Western Society, an influence that has spun out of control to the extent that Reason has become another ideology ruined by it's own dogma, easily manipulated by people seeking power for it's own sake. In On Equilibrium Saul proposes six qualities: common sense, ethics, imagination, intuition, memory, and reason and suggests that each quality works best when they are used in tandem to produce a balanced way of viewing and responding to our surroundings. Reason is not dismissed, but placed within a wider context, balanced against the other five qualities.I can see why my early twenties self was so taken with this book. Saul isn't fond of Plato, Aristotle or absolute truths. I've gotta agree with Saul and my 23 year old self on that one. He cites historical references that aren't exclusively Dead White Men, I did and do still appreciate that. But, he cites Vico far too often and is prone to rambling. My younger self would have thought that just made the book more intellectual. Thritysomething me thinks it's in need of editing. Halfway through I started wondering if I should just close the book and go find a copy of Vico.Ultimately I find the book still hits a nerve for one reason: On Equalibrium makes a solid argument against utilitarianism, linear-thinking and the technocracy. Saul illustrates several scenarios where that way of thinking has led to disaster. Younger me read this after escaping several utilitarian environments: the suburban high school, the white middle-class bedroom town, the corporate job, to attend Art College (a utilitarian horse of a different colour). Back then it was the lack of certainty involved in pursuing a visual art education over something more linear like engineering or teaching that caused so much trouble. Now I'm reading this book as a new parent. A new parent who has zero intention of leaving the city, switching to a corporate job or even joining a Mommy group. This is causing tension with some people in my life who insist parents follow a specific checklist. Utilitarianism comes out in force, ignoring many of the qualities outlined in this book like memory, imagination and common sense. One child rearing scenario is presented as an absolute truth, uncertainty is presented as something to fear.I know Saul presents examples that are bigger and more important, like how utilitarian thinking can lead to genocides or backing an unjust war, but I think the reason this book still resonates with me is because I can see where his views hold true in my day to day life and I appreciate coming across someone who can provide the proper context and vocabulary to help me better articulate my own feelings. It's a fairly hard read, but the author's insights are both valuable and timely. I'd recommend it to anyone that feels/believes that our society often behaves in an irrational manner, that contradicts what one might expect from an "intelligent" species. Not his best. In Voltaire's Bastards he produced a seminal original work illustrated by historical detail and in Unconscious Civilization he extends his ideas advocating for history, memory etc to compliment reason as opposed to being subjected by reason. Unconscious Civilization originated from the Massey Lectures a format that served the book well as it forced Saul to compress and tighten his ideas. In On Equilibrium he clearly needed someone or something to provide focus and brevity. His tendency to repetitive writing will frustrate the reader. It appears that he has reached the pinnacle of a public intellectual -- no-one is willing to tell him to move on. Having attempted to read straight through the book more than once, I have been bogged down by needless repetition each time. As for Equilibrium, Camus expressed the idea much better in the Rebel. Should be required reading for every Prime Minister. This is such an important book to read in these times. A sobering yet inspiring fidelity to shared forms of common sense that are what we need to look at to handle today's challenges in an ethical and intelligent manner. It is also a great antidote to narcissism tendencies in self-improvement ideologies.I believe that the only true flowering from this book will come if more people talk about it. So I give this a strong recommendation to be recommended to others! I started this some years back - perhaps 2010. I enjoyed his remarks about the need to avoid elevating virtues in isolation - and the risks of doing so. His criticism of worshiping reason and discussion of its limitations was well-founded and has stuck with me.Weighty stuff and I didn't get very far before my interests moved on. Three stars. A good (but hard) read on gaining various insights to the human experience. Recommended when one is in an introspective mood. Has been sitting on my shelf for some time and I haven't given it a proper read. Getting to it. I tried, but could not make head or tails of this book's point. John Ralston Saul - John Ralston Saul is a Canadian author, essayist, and President of International PEN. As an essayist, Saul is particularly known for his commentaries on the nature of individualism, citizenship and the public good; the failures of manager-, or more precisely technocrat-, led societies; the confusion between leadership and managerialism; military strategy, in particular irregular warfare; the role of freedom of speech and culture; and his critique of contemporary economic arguments.